Anywho, when I saw these little shortbread cookies with cherries and white chocolate, I knew I had to give them a try. My family sampled them last night, and they were a huge hit to say the least. I let everyone have two, and even the non-cherry lovers kept begging for more until I threatened to make them wash dishes if they didn’t stop bothering me. Not really. I am a perfect mom and I never get irritated by my wonderful children. Haha. If you like white chocolate or cherries, you should give these a try. Like soon. They are buttery and just melt in your mouth. The white chocolate makes them extra yummy! Plus they look so pretty with the little cherries peeking out. A perfect addition to any Christmas cookie tray!! Drain and chop the cherries; set aside. In a large mixing bowl, combine flour and sugar. Cut the butter into the flour mixture using a pastry blender. Hint: Let the butter sit out for 10-15 minutes, or it is very difficult to mix in. It took me forever! 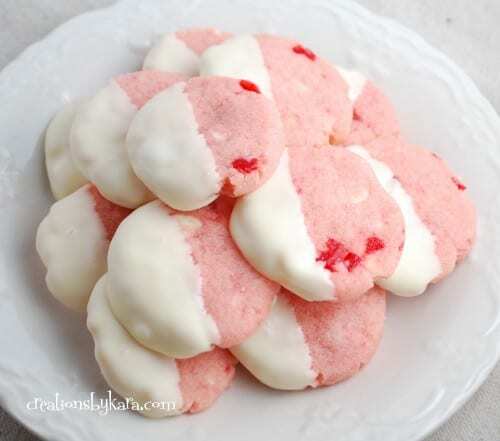 After the butter/flour mixture is crumbly, add the cherries, 2/3 cup white chocolate, and food coloring. It will still be really crumbly, but don’t panic. Knead for a few minutes till the dough becomes smooth. Again, my butter was too cold, so this took me forever, but eventually it worked out. Roll dough into 1″ balls and place on cookie sheets. Use the bottom of a glass dipped in sugar to flatten each of the balls out. Bake at 325° for about 10-12 minutes. Cool completely. In a small glass bowl, melt the shortening in the microwave. Add the 1 1/3 cups white chocolate. Microwave at half power, stirring every 30 seconds, till smooth. Dip half of each cookie in the melted chocolate and place on waxed paper till chocolate sets up. -Makes 4-5 dozen cookies depending on size. We made these just before Christmas. They are wonderful, easy to go back for more! 😬 Very pretty cookie. We did not add any food coloring but did add a little more cherries and a little bit of the cherry juice (couldn’t resist) and the cookies turned out just as pink as in your pictures. Very pretty yummy cookies! I hate to post this here but couldn’t find an email to contact you at. Just wanted to let you know that Sweet Nothings Desserts facebook page has your picture of the above cookies posted on her page as her own and even went as far as to crop out your water mark and add her own. You can easily tell the cookies she has posted are yours from above. 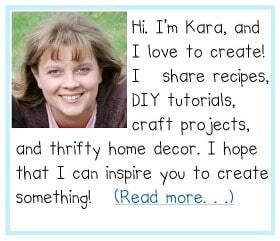 Just about any crisp clear picture she has posted if you google the item you can find the image and a link back to a blog. This is my first day on pintrest. I found this recipe and thought I just HAD to make them for Valentines Day. I’m really excited. I found this recipe via pinterest too. They’re some amazing cookies! I made these tonight. They are good but to me and my husband, they are too sweet with the white chocolate on them. So we rolled them in coconut before baking and man they were very good. We think it even brings out the almond and cherry flavors more. Very good recipe- love the way they look!! They looks so pretty…I am sure they taste great too! Um, YUM! These are perfect for Christmas!! They looks so pretty and yummy!! !